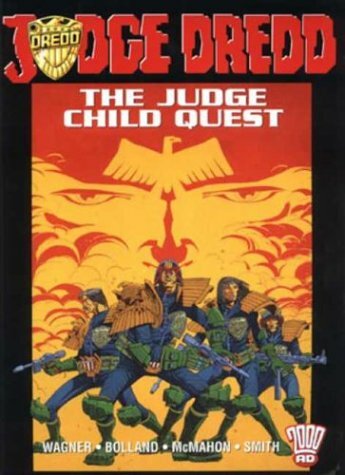 A classic of the genre wherein the steeliness of Dredd is exported to the rest of the universe as he searches for a crucial child who can save MC1 from a future catastrophe, who has been kidnapped by the crazy Angel Gang. Most of the humour comes from the warped worldview of Pa Angel and the irony on his unusual take on parenting. This is one of the serials of the character that will be most remembered, along with others such as the Chopper collection and the Dark Judges. All these early to mid 80s strips are the apex of the comic. Great stuff. Despite being not one of my favorite stories, it is very fun to read, neverthless. Judge Dredd and his companion are on the search for the prophetic child from the title, whom is believed it can stop the war which will destroy Mega City 1. The bulk of the comic takes place across the space, to be specific, in various place of universe, where Dredd will have some quite bizzare and dark encounters with its inhabitants (one segment has a malevolent planet-thing) and some are more in the vein of his usual trademark style of satirical, tongue-in-cheek humor (alient planet where the buildings are in shape of tea cup lol). The story ends up on the anti-climactic note and apparent cliffhanger, which is probably the weakest part on the book. And the child itself is not what is believed to be. See it for yourself! Not my favorite Dredd tale of the ones I've read so far. But it's still a great story. It was a fun, planet-hopping romp through the future galaxy in which Mega City One exists. But in the end, I missed earth more than I would have imagined.